The new model season is like Christmas here at MO, and reading Aprilia’s release just gets us even more excited about the 2019 model year. Aprilia RSV4 1100 Factory – the latest step in this evolutionary line – boasts exceptional performance combined with a racing frame and suspension and an electronic controls package, both evolved even further. New for 2019, the RSV4 1100 Factory is the lightest, most powerful, and fastest RSV4 ever created. Simply unrivalled. The Aprilia naked range, heir to a family of motorbikes which has been voted over time as one of the most adrenaline pumping and efficient bikes ever, achieves absolute performance levels and sophistication, thanks to Aprilia’s know-how acquired over years of winning premier level competitions and the experience of the Tuono history, which is thus confirmed as being unbeatable on the track and endless fun on the road. 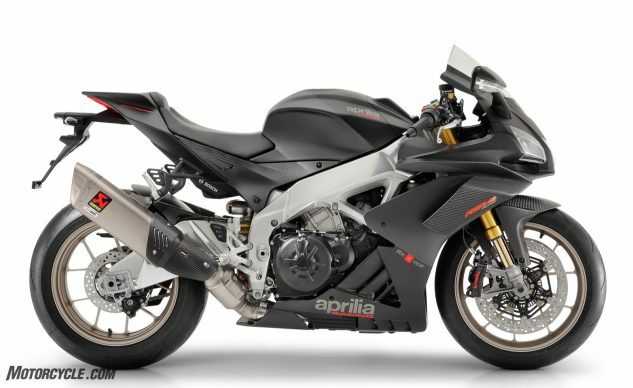 The new Aprilia Tuono V4 1100 Factory comes standard with the most advanced and efficient electronic suspension system currently available, the latest technological frontier offered by manufacturer Öhlins, developed in close contact with Aprilia engineers. With the upgraded electronic suspension, adjustable to suit any rider need, and along with the inherited RSV4-style tail section, the Tuono Factory is the model of choice for the performance-demanding rider that will not settle for less.